Kevin and Shannon Ayres were true pioneers, purchasing the very first official Pump It Up franchise in the country and opening it in Frisco, TX in November 2002. Their Grand Opening brought in more than 1200 people, one of the largest in the country to date. Since then, they have hosted more than 20,000 birthday parties and countless school fundraisers, team parties and special events, including a private Sensory Jump each month for families with special needs children. They were also the creators of the Jump-N-Art camp program that is now offered corporate wide. The Ayres' have been great supporters of the Frisco community they serve as well, sponsoring local sports teams, donating countless parties to local schools for silent auctions and partnering with organizations like Lovepacs - Frisco who provides food for children on the Free/Reduced Lunch program and don't have enough to eat during school breaks. Kevin and Shannon reside in Frisco and have raised their two children there. They are grateful for the endless support from their community, allowing them to serve the families in Frisco for more than a decade! Pump It Up of Frisco is a proud supporter of Lovepacs-Frisco, an organization dedicated to feeding at-risk children in FISD during school holidays! We are an official drop-off location for food donations and open the facility several times throughout the year for "packing parties". Families come to play, pack Lovepacs and have dinner, all for free with any food donation! Like our Facebook page to find out when the next packing party is! "My daughter had her 6th birthday party at Pump It Up Frisco, and she is a little on the shy side. When it came to her being put in the spot light or recognizing her, the staff (Colton) was very sensitive to her feelings and didn't force her to do anything she didn't want to do. We were very appreciative of the thoughtfulness shown. Staff went above and beyond our expectations! From the moment we walked in until the time we left, the friendliness, cleanliness and overall experience was amazing. Super impressed! " -Rachel K.
"Great Pump It Up location! Very friendly, clean, and organized. My son and my family/friends had a great time! Everything was well planned out, timed, and organized. The kids never got bored because there was something new all the time! Our helpers Alexis & Alexis were great and kept everything moving smoothly and efficiently! As soon as we got home my son made me promise to take him back again. He had a blast and we will definitely be returning!" -Alyssa E.
"From the beginning "Captain Awesome and Super Mario" were very attentive and engaging. They made my son feel super special and played appropriately with all of our guests. Their energy and smiles made our event even more special. As a parent, they made me comfortable letting me know that safety was their priority and they patiently explained each activity and waited for me to verbalize understanding and approval. Our party started on time and was ran smoothly. 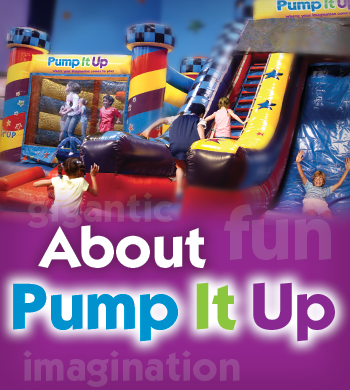 All of the guests, parents and kids, were amazed and truly enjoyed our party at Pump it Up" -Ashley N.
"We have had kid parties at other venues and this Pump It Up location was awesome! The staff was energetic and seemed to enjoy hosting us. They did an excellent job of keeping everyone happy. We really like not having to share the bounce rooms with other kids as you do at some of the other party locations with bounce houses." "Sawyer is just awesome with the little kids! We really enjoyed having him as part of our daughters birthday party. The other helpers were also wonderful and we would highly recommend you to everyone we know. You made it SO easy!" "Staff was organized and kept the party running smoothly. Staff was great with the kids - very friendly and showed enthusiasm." "The staff is organized and prepared which is great for the parents and the kids had a blast at the party!" "The staff exceeded our expectation! They were so friendly and helpful. Then the party room girl went above and beyond to make sure everything was set up just as we liked!" "One of the young men got the kids involved and was running around and chasing the kids with the ball. The kids loved it. Unfortunately only 5 kids showed up to my sons party but that young man really engaged the kids and had fun. It really showed that he loved what he was doing." "The girl in the party room was exceptional! She wanted to make sure we were happy with everything! She knew when to step in and help!"